Hello friend! I hope you’ve had a splendid day thus far. As you may know I’m a firm believer that most food is really just a vehicle for delicious sauces, dips, spreads, rubs, or marinades. In the spirit of that belief I’ve been on somewhat of a vinaigrette making kick. You can check out some other sweet recipes here and here. I usually end up looking around my kitchen for inspiration and the other day I saw some apples sitting in my fruit bowl starting to turn brown and squishy. Since I had just made kombucha the day before I knew it would be at least another week before I needed to use them and by that point they would have been beyond saving. I also realized I had a bunch of field greens that needed to be eaten ASAP and nothing delicious with which to smother them. Thus this dressing was created. If you’ve read my post on my pantry staples, then you know I typically have all the base necessities for a vinaigrette in my kitchen, which makes it super quick and easy to whip up delicious new creations. Well enough of my rambling, let’s get to the good stuff, shallst we? Traditionally this vinegar is made from a reduction of the cooked juice from a white grape called Trebbiano. Many commercial balsamic vinegars on the market are made from wine vinegar and have added colour, caramel flavour/colouring, and sometimes even guar gum or cornflower to simulate the thickness of real balsamic vinegar. When looking for a balsamic, make sure it contains none of the above-mentioned ingredients. Real quality balsamic has some great health benefits because it contains antioxidants such as quercetin, which helps boost the immune system; and polyphenols that help stimulate pepsin production, a digestive enzyme required to break down protein. 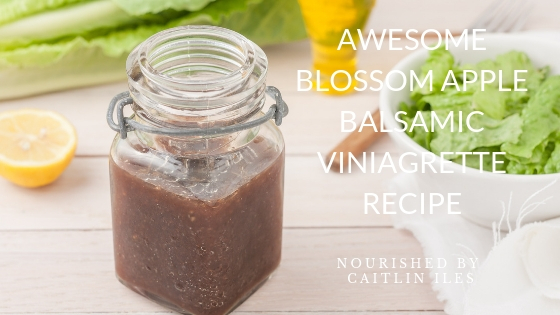 Studies have also shown that ingesting balsamic vinegar can help with β-cell (specific cells in your pancreas that produce insulin) production of insulin and improve post-prandial hyperglycemia and insulin resistance, which makes this vinaigrette great for helping keep our blood sugars balanced all day! Like balsamic vinegar, apples also contain some great nutrients that help balance your blood sugar and boost your immune function. Certain polyphenols in apples have been shown to decrease the absorption of glucose in the digestive tract. If you’re absorbing less of the glucose you’re consuming it won’t have as much of an impact on your blood sugars, which means less chance of a spike after a meal. Apples also contain quercetin, which, as you’ve seen above, boosts your immune system. Quercetin also inhibits enzymes involved in the breakdown of complex carbohydrates into simple sugars such as alpha-amylase and alpha-glucosidase. Again, if your body has fewer simple sugars to deal with your blood sugar will be much more likely to remain in a stable, healthy range. First of all, like balsamic vinegar there are different qualities of olive oil. The best quality oil is Extra Virgin Olive Oil (EVOO) obtained from the first pressing of the olive fruit. Research has shown that later pressings of olive oil do not have the same anti-inflammatory effect in the body as pure EVOO, likely because the polyphenol/antioxidant content of the oil diminishes drastically with each pressing. There is also quite the controversy surrounding olive oil as many companies who claim to be selling 100% EVOO are cutting it with cheaper, less healthy oils such as canola (Booo!!! Hiss!!!) or do not meet the quality standards of an EVOO product. Look for high quality products from reputable companies to ensure you’re getting the best possible health benefits for your dollar. I’ve read that Costco’s olive oils are certified EVOO and in terms of quality and deliciousness for cost, they’re the best deals I’ve found as well. Olive oil has a laundry list of other health benefits that include increased nutrient absorption of fat-soluble vitamins from vegetables, decreased risk of heart disease, and some cancers. Don’t be afraid of incorporating this delicious and health-promoting fat into your diet! Alrighty, now that you’ve seen what this sweet dressing has to offer I guess it’s time to figure out how to make it. This recipe is packed with the sweetness of apples & the tanginess of balsamic vinegar to create the perfect accompaniment to any salad. Core and roughly chop apple, leaving peel on. Put in blender or food processor. Add vinegars, honey, garlic, mustard, and sea salt to apples. Slowly drizzle oil of choice into mixture while blending on low. Let sit overnight for best flavour. Well that’s all for today friend. Thanks for stopping by.